About: Bengal serve a variety of Indian dishes at their restaurant including satay and naan bread as well as chicken, beef and lamb dishes. If you cannot finish your meal, then you can ask for a doggy bag and the staff will happily oblige. A takeaway menu is also provided. Catering for private parties of up to 20 guests is available upon request. happy i found such a nice quite food place. just round the corner from royal oak station and also has great customer service and beautiful food. will love to go again. the bengal is great food wonderful service and very welcoming but the food is outstanding and also great value for money is a place you can come together and make a night of it is located in one of the best Area in west london where you would wanna eat !!! All I can say is fabulous food! unbelievable Indian restaurant & has great expectations. the bengal indian resturant is one of the best curry house i have been to in west london the food an the price was worth it very good service aswell an here food was realy teasty would come back again an any curry lovers out there ill recomend you to go to the bengal its wonderful! Friendly and attentive service, a generous menu, very good value for money, close to Royal Oak Station and easy to find. Food quality I would rate as above average. 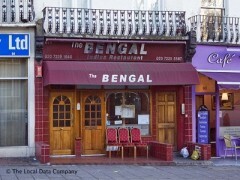 I'm 100% Bengal myself so I thought I'd get a Bengal lunch at the restaurant on Porchester Road. I absolutely love this restaurant! The food was terrific; outstanding service. I would recommend this restaurant to anyone who's interested in trying the Bengal kitchen. The menu, by the way, was very inspiring. I do a lot of Asian cooking myself, and the recipes on the menu are definitely worth a try. The restaurant is located right next to tube station (Royal Oak; Hammersmith & City Line). I have been there only once but I will definitely be back - every season over and over again! I have been going to The Bengal restaurant for many years now and can say as a big curry fan, they serve the best lamb/chicken curry ever! Even the mixed grill at about £8 a go is huge and would fill 2 diners easy!!. Great food, Great value, Great service, never too busy, always attentive, Nice atmospheres for couples & parties alike.